Is it OK to use cartoons to keep my 5-month-old busy while I do things around the house? Posted September 24, 2009 under Ask the Mediatrician. How can I convince networks not to play violent commercials during family programming? Posted September 21, 2009 under Ask the Mediatrician. Q: My husband and I are greatly concerned by the commercials that are played on television, especially during “family” events like football or NASCAR races. I have contacted the FCC and NASCAR and they said that I basically have to contact each network one by one to voice my concerns. Where can I find information backing up my concerns that these types of visual images are harmful to my young children? Which computer games are good for my 2 year old? Posted September 17, 2009 under Ask the Mediatrician. Q: I’ve introduced my 22-month-old son to a computer program designed for babies that makes shapes and plays a sound every time a button is pushed. Lately, I’ve noticed that he is becoming more thoughtful about it. He used to just bang at the keys, but now he pushes one button at a time and watches what happens on the screen. For his birthday, I’ve been looking for an age-appropriate game that involves more thought. I have found a few games that are marked for 2 years and up, but they seem mostly targeted at kids closer to age 3 than 2. Do you have any suggestions? Is there software I can buy to limit my kids’ computer time? Posted September 10, 2009 under Ask the Mediatrician. Q: I have three sons, ages 8, 5, and 5 (twins) who love to play computer games (Club Penguin, Webkinz, PBS kids.com, and others). I try to limit their screen time to one hour per day, but I know they have been using it for longer than that when they can get away with it. Is there a parent-controlled program I can buy that allows each child to login and have only a limited amount of access per day? 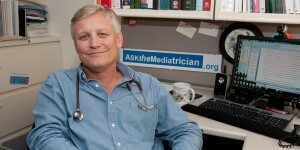 Dr. Michael Rich answers this question and others on Ask the Mediatrician. Posted September 3, 2009 under Ask the Mediatrician.